K is for KICKING. 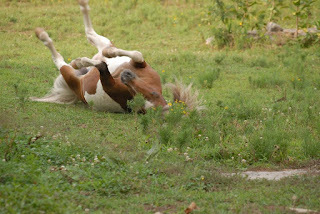 Nibbles kicking his legs in the air! Cookie jar 1.99 at Goodwill. 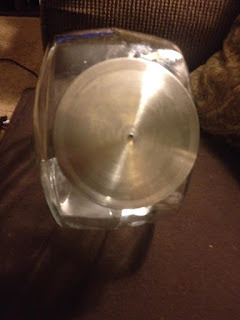 And you have a large cute candy container for my office all for around $3.00. 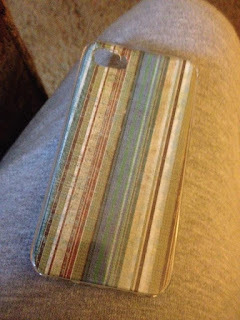 Took a clear plastic iphone cover... cut a piece from scrapbook paper and BAM! I can change it out anytime for a new cover! 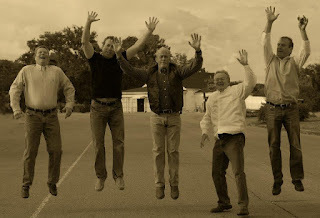 Old Hickory Boys band jumping for joy! 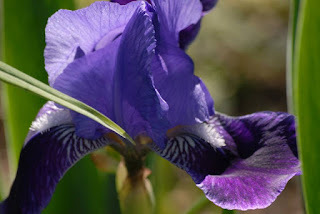 in my yard last year. Decided that I would start bringing home a nice size rounded rock from my trips to different areas and vacations. This is what I plan on doing with those rocks. I will be placing them all around my yard in flower beds. Be such a nice reminder when I go out to look at my flowers or to water. 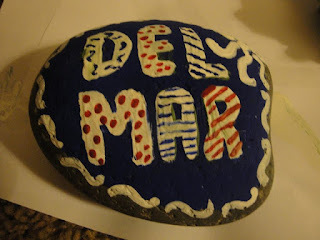 This rock was picked up on Del Mar beach while out walking along the beach. And this one was picked up out front of my son's yard. My niece Paige got married July 4th. 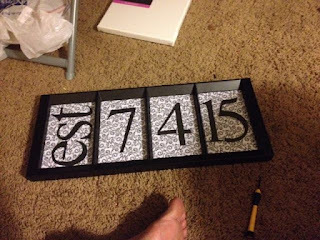 This is the gift I made her and Adam. This is the gift I made for Cindy. 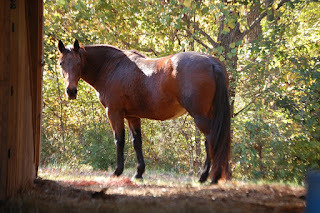 A good friend that I met when I went to work for the TBI. She got married July 19, 2015. I was able to find another 4 slotted frame but this one brought on a great idea. 4 slots for the date and 4 for pics of the day. Happy Marriages to Paige and Adam and Cindy and Mike. Last night I went to the Wilson Co. Fair. First time in several years. Best fair around. Took a few pics. Meet Misfire. Isn't she so pretty! I had an amazing time in California. This is a visitor I had while chilling at the pool. My two sons. My son Cory to the front and my other son by another mother Russ near the ocean. My very first trip to Sea World! Love it. This seal was just hanging out "IN" the float!